Music: Skeeter Davis - "Gonna Get Along Without Ya Now"
It is mighty convenient that Jeopardy! 's name lends itself to inclusion of the word "party" so easily. Here's WHO WAS THERE. I guess I don't know everyone's last name, or proper spellings, and there were 3 or 4 complete strangers there who've been described in the terms I best know them, and others that I know, just not their names. I included employees of the joint, because make your own list if you don't agree wit' dat! Well, that is 76 people and potentially counting (plus me). Pretty sure there were more. Notification of specific omissions welcome/encouraged. No offense intended if I forgot you. Was Sara Wooldridge there? I think maybe, but am having trouble remembering. Whoops, she isn't on LJ anymore. Was Jack from the Hibernauts there? I think maybe. Tim Pinkerton and Samantha showed up later, but only to give Denny his spare keys, as he'd lost his main set somehow while there. I think O'Donnell also came later but before the main masses cleared out I think. I have never seen that many people there, which says something because I am there with some frequency and I have seen a lot of people there. I think COOLHAND made like 30 Squidtinis. Stephanie made stickers for everyone to wear (I'll scan one in eventually, I took home all the leftovers). I brought the Alex Trebek mannequin head that COOLHAND and Amanda made for me before I left. Matt Harnish gave me a vinyl copy (allegedly from his own collection) of the Greg Kihn Band's Kihnspiracy (whose first track is, of course, "Jeopardy"). Valentine brought me some amazing cupcakes from her workplace (she explained that they'd been squashed in the process of riding her bike to Newstead and made probably the saddest face I've ever seen). Josephine made these really tight cupcakes each with a tiny pancake on top. The staff were all dressed in Squids colors, Lauren actually wore a just-one-shade-away version of what I wore on the show. It was something to behold, I tell you! Later a few of us went to the Hideaway, this guy Dave's house, Sandrina's, hoooh. 1) Some blarg entry Dave Jacobsen pointed out to me that I guess his girlfriend follows? 3) Yet another Flickr stranger posted this bad boy. 4) The Jeopardy! Archive record of the game I played (needs some updating as of right this second) and their personal profile of me (has some information but capitalizes my name incorrectly). 5) The Webster University School of Communications Alumni Newsletter (SCAN) blarg entry with some nice comments from Mike Steinberg. 6) The Webster University Twitter entry where some Twittering was done about my appearance. 7) Some kinda list of other people that Twittered about this thing? Someone over at WU seems to think I'm an MA. Fine! 8) Someone at BodyBuilding.com of all places posted this entry in a forum. There's a quick YouTube video in there, even, of me getting a question right (it's a question about Montana, and the poster is from Montana). Note the comments, they're YouTube-tastic! 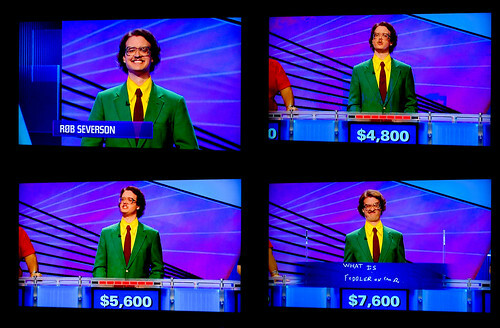 I guess that face I made during Final Jeopardy! is making the rounds to some extent, I saw it originally here but I know Shannon Knox and some others have replicated it for showing here and there...who posted that originally? 9) A thread from reddit.com that mentions me but I can't say for sure what the initial poster is trying to say because I don't know anything about reddit.com. Some pretty sweet comments there, too (a hipster, they call me! It goes to show...). 10) A segment from an episode of Nightline that they were taping the first day I was on set (I didn't get chosen to play that first day). I'm in the video a little bit, Maggie the contestant shepherd lady talks to me about (what else?) what I wore as I'm taking my spot in the studio audience. 11) The RFT is apparently going to interview me (tomorrow? ), and whenever they do, there'll be something to show here at ol' point #11. Pretty sure it aired today, so in case anyone was curious, Chris lost on today's episode (he'd won two prior to mine for a total of three). Even my best High School friend Dustin Mendoza found out about it somehow (he's been notoriously difficult to contact in recent years) and E-Mailt me in the wake of the screening. I had E-Mails, IMs, and phone-messages galore about "crap I'm stupid and missed it!" or "good job!" or whatever, when I finally made it back home to my phone/computer. Wellp I did get that Denny's question right, maybe they'll come looking for me for the hot endorsement deal, right? Hah hah.